Labor Day has come and gone, which means it is officially the end of summer. *Insert tears here. * That also means that it is time to end my Summer of Series. At the beginning of this summer I set out to read some of the many unread series that I owned. I had a goal of reading 5 of them, and I ended up reading 4 including the one I’m posting about today. (Check out more on those series here: The Blackstone Affair, The Stage Dive Series, The One Night Series) So I almost made my goal, but really I had the chance to read and LOVE so many of the books that I’ve had forever and have been dying to read! I honestly couldn’t be more thrilled with what I got to read and experience with these books this summer….it was amazing to say the least. I absolutely loved my Summer of Series, and I wish it wasn’t ending here, but alas summer is over so I guess I must move on to something else. That in no way means I am abandoning the idea of reading all of those fantastic series, it just means I need to find a new name for my series reading endeavor…I’m thinking of calling it Falling Into Series… (Get the fall theme?!) but we’ll see where that goes. I wanted to end my Summer of Series with a series that I have had for forever. Literally. And I think it’s only fitting that not only was this series not on my original Summer of Series list, it’s only two books which makes it more of a duet than a series, but I just couldn’t not read it anymore. So with a little encouragement from one of Author M. Mabie (who is amazing by the way, if you haven’t read her books, do it. I LOVED them all!) 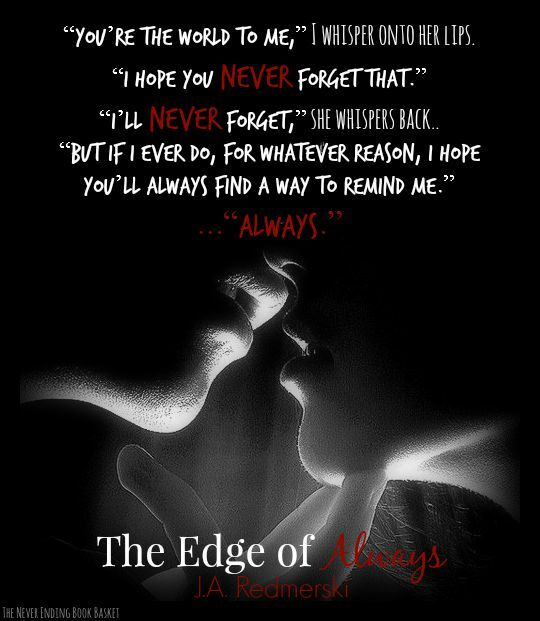 I decided to finally read The Edge of Never & The Edge of Always by J.A. Redmerski. What can I say about these books….I LOVED every spectacular word of them. Wholeheartedly with everything that I had. They were mesmerizing, bursting with vibrancy and feeling and so much meaning, and I was so beyond emotionally invested in everything that I was reading. Camryn and Andrew’s story gave me everything, and I gladly accepted everything they gave me because I was completely blown away by everything that I got from them. These characters are more, their story is more, and just everything about them is more. I loved these books, and I’m so mad at myself for waiting years to read these books. Yes, years!! I have waited way too long to fall in love with these characters, but I couldn’t be more thrilled with what I got from their characters and from their unforgettable story. 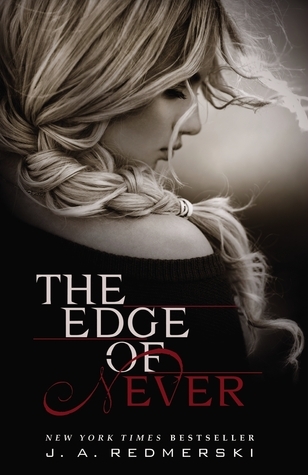 The Edge of Never & The Edge of Always tells the story of Andrew Parrish and Camryn Bennett. Two vibrant, unique, authentic and mesmerizing souls whose paths cross in the middle of nowhere on a Greyhound bus, and what happens when their two distinctive paths begin to intersect in ways they never imagined they could. 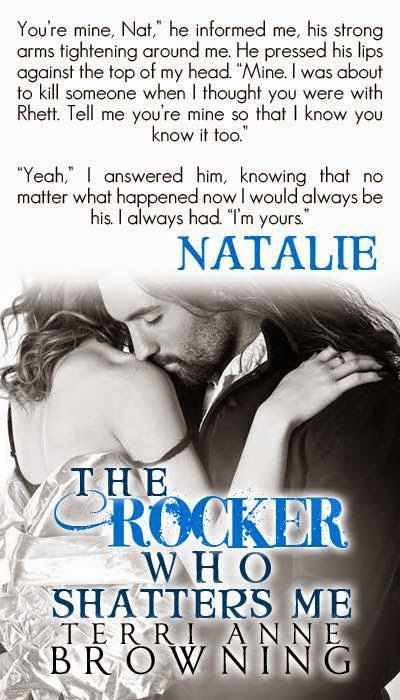 Their journey together in this series has its ups and downs, twists and turns, and it definitely puts your emotions through the ringer a bit, but through all of that you fall heart first in love with these two characters and just who they are. Their characters are real and messy and they have gone through way more than any one person deserves, and when you begin their story you will begin connecting to them from the very first word and you honestly won’t stop. I don’t know if I will ever truly stop thinking of these characters in some way, shape or form. They’re that memorable. They’re that consuming. They’re that everything. This author does an amazing job of allowing you the chance to get to know them, to understand them, and to fall in love with their characters over the course of this series. You get such a foundation with them both, you get the phenomenal opportunity to get into both of their heads, and you just get them. You get why they think the things they do, why they’ve made the choices the do, why they chose to go on this great adventure with one another, and so much more. You get Camryn and Andrew full force, and it’s the best thing because it allows you the chance to love them fiercely. I cared so much for the two of them, felt for everything that they were going through, and just relished in the connection I felt to them both. I loved their characters so truly, connected with them so hard, and just loved them both to pieces because they were who they were and they didn’t apologize for it one bit. Suffice to say, Andrew and Camryn are just about every positive adjective under the sun. Camryn is real and relatable, and has such a determination and fire to her that just makes you love her. You get to know her first in these books, and I felt like she was the closest of friends after reading these books. Andrew is charming and witty, and has that same kind of determination that just sets him apart. He’s highly memorable for so many reasons, much of which comes from the life and goodness that just emanates from him in the most amazing way. These two cross paths in the most unlikely of ways, when neither of them is looking for anything, and yet soon they find that they have found their everything. Their connection and story begins to build, and build, and build some more in The Edge of Never, and then continues to build and grow and evolve in The Edge of Always. J.A. Redmerski does an utterly fantastic job of creating that build, that tension, and all of the glorious feeling to go along with it. She pushes these characters in the best way, she makes them fight and work and choose, she allows them to grow and evolve as individuals, and that results in something that is nothing short of spectacular. Getting what I did from Andrew and Camryn’s characters was wonderful in every way. These two have such a spirit and drive to them that is so distinctive, and you get to experience that vibrancy and liveliness while falling so hard for their characters. Their story was mesmerizing and enrapturing to say the least, and the moment I started these books I could not put them down. Along that event filled ride, I got every lick of emotion and feeling and intensity from them both because of this author’s fantastic writing and storytelling. 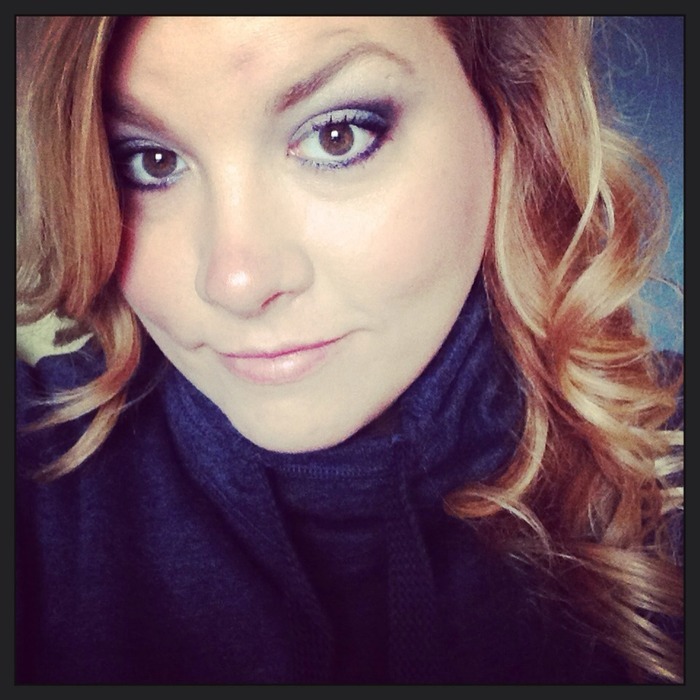 She creates a book and a world that you get to live and breathe and experience everything in. You get every hope and fear, every want and desire, every moment of falling and feeling, every moment that makes your heart literally beat out of your chest. You get everything because J.A. Redmerski thoughtfully crafts and cultivates everything in such a way that you’re there with Camryn and Andrew, living and experiencing it all, and that will just leave you in literary awe with what you get from them. What can I say? I loved these books. I loved the moments that made me laugh, the moments that felt like my heart was being ripped out of my chest repeatedly, the moments that gave me hope and tried to heal me right along with Camryn and Andrew. I loved when these characters made me feel, and think, and wonder, and when they just blew me away with who they were. I loved where I got to see them go, how they evolved and changed, and how they stayed the same too. 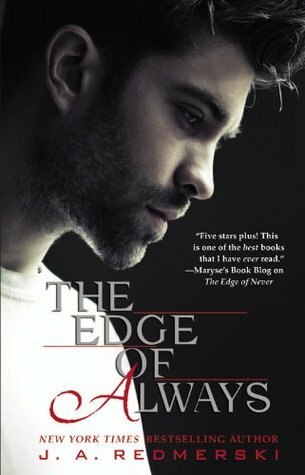 I loved everything about The Edge of Never & The Edge of Always because these books were well rounded, outstandingly written, and just captured every single aspect that makes a book exceptional to read. When I finished these books, I seriously wanted to kick myself for having waited so long to read them, but in the end I am just so in love with these books and what they gave me. They gave me so much, and I know that I will never forget so many things about these books and Andrew and Camryn’s wonderful little selves. This series was just amazing. Period. I loved every feeling and emotional word, every breathtaking moment, and every single thing I felt and thought and experienced while reading because it just made me fall under the spell of these characters even more. I loved getting to be there through it all with them, and let me just say that J.A. Redmerski gives you every ounce of their story in a way that just works for these characters. Their story will satisfy you in every way, make you feel so much, and will have you loving everything that you’re getting because it is truly something else. These books are some of the best I’ve read, and what they evoked in me as I experienced them fully is something I will always remember and love. Just like I will always love Camryn and Andrew, everything they went through, everything they fought for, and everything that they are, because all of that is absolutely phenomenal. These books reminded me once again what books can do for you, what they can make you feel and think and experience, and how they can blow you away in every way if you give them the chance too. Keep reading below to find out more on The Edge of Never & The Edge of Always by J.A. Redmerski! “I guess we are just two lost souls swimming in a fish bowl,” I say. Be sure to check out more about these unforgettable books, and the fantastic J.A. Redmerski at the following links! I feel the sun on my closed eyelids and something sharp poking me in the face. Moving my hand, trying to get away from the pain, I whimper when it scrapes against my cheek. I lift my head and run my fingers along the side of my face, feeling wetness. Opening my eyes to see a light smear of blood on my fingers. I flip my hand over, and then I see the gaudy ring that is now taking up residence on my ring finger. “Great,” I whisper, closing my eyes and laying my head down again. I prayed earlier, before I went to sleep, that when I woke up, the ring I’m wearing now and the man who put it there would be nothing but a bad dream. No such luck. I roll over and take a shaky breath, wanting to close my eyes for a few more seconds, wishing I could just sleep until everything was back to normal. Obligation is the next installment in Aurora Rose Reynolds utterly fantastic Underground Kings Series. 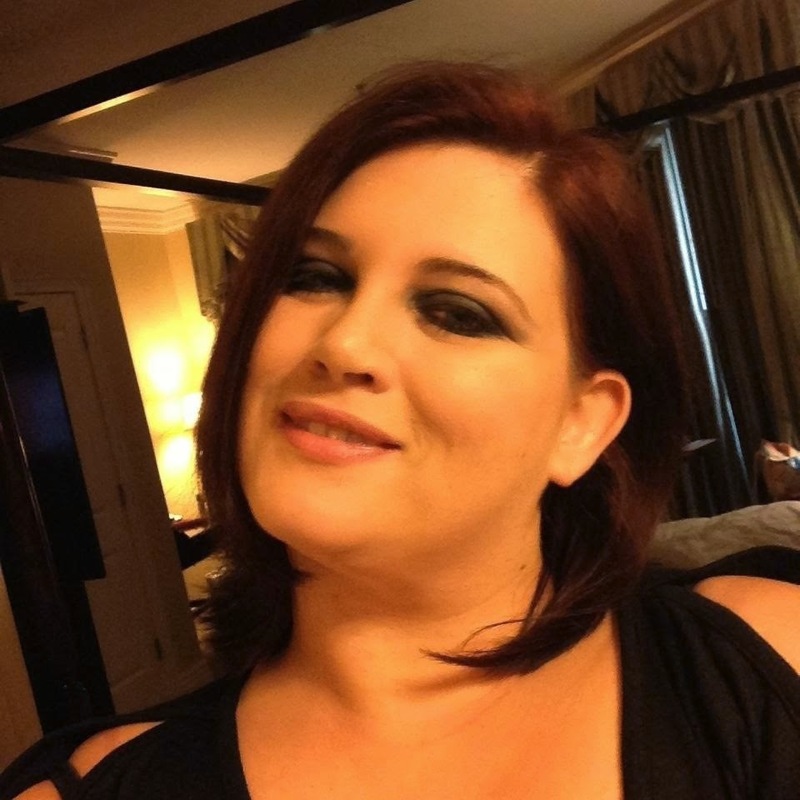 Each of Aurora Rose Reynold’s books have been absolute must reads for me because boy does she know how to write one heck of a story, with an absolute gem of an alpha male, and the perfect female counterpart with her own wonderfully distinctive personality. Obligation is no different. It has every aspect and more that makes me love a book, and the reading experience it gives me. I’ve loved all of her books, but there’s just something about this series that just gets me. Something that just hooks me into it all that much more. The darker and more intense feelings because of the nature and premise of this series has me beyond enthralled. I also seriously love how much these characters and their storylines just push the boundaries a bit more. It just works, and I can’t get enough. Obligation, and Kai and Myla’s story was one I absolutely loved for what it gave me as a reader. I honestly wish I could spend more time in their book, because I loved both of those passionate people immensely. Their story in Obligation is one that will just have you realizing once again what it means to read and experience a truly fantastic book. The softness and strength of Myla. Myla had such a grace and softness to her. I was kind of taken aback by how beautiful her character was, and I don’t just mean physically. Her emotions and the things she felt, the essence that was her, her spirit, and just the things she said and did over the course of the book were just beautiful and showed a real sense of strength from within her. After all that she went through and overcame in her life, to have that perfect blend of softness and strength just kind of left me in awe of her character. Kai’s unyielding self. Kai was a character I was sold on the instant I met him. He is a protector, someone who will go to the ends of the earth to do what needs to be done for all those he cares about, and it just so happens one of those people is Myla. What Kai embodied in this book with just the general magnificence that was him melted my heart because of the fierceness of what he felt, the passion behind it, and all the meaning and reasoning for his actions. Kai is the ultimate protector, and you feel that as the reader. It’s also going to have you wishing that you had your own Kai in your life because of what that man makes you feel. That wonderful push and pull. There is a lot of will they or won’t they in this book. Aurora Rose Reynolds creates the perfect amount of push and pull between Myla and Kai, and that will just have you clawing at what these two could share together. Fighting and praying that they’ll get it together. All that push and pull and back and forth will have you feeling as if you’re building towards something pretty spectacular, and let me tell you that that push and pull will just have you soaring with love for Myla and Kai, and what they experience as a result of that push and pull. The perfect amount of counterbalance. Where Myla is soft and sweet, Kai is that perfect counterpart of hard and not so sweet. They balance each other out phenomenally, and I couldn’t get enough of seeing that balance attempt to come together. I also effing loved what these two brought out in one another. In a way Kai makes Myla stronger, and in another way Myla makes Kai softer. They make each other better, and they make each other whole, and getting to see how all that balance tries to unfold is just outstanding. All the feeling. I can’t say enough how much I felt this book in every way, shape, and form. All the passion, all the want and desire, all the doubts and questions, and all the possibilities. 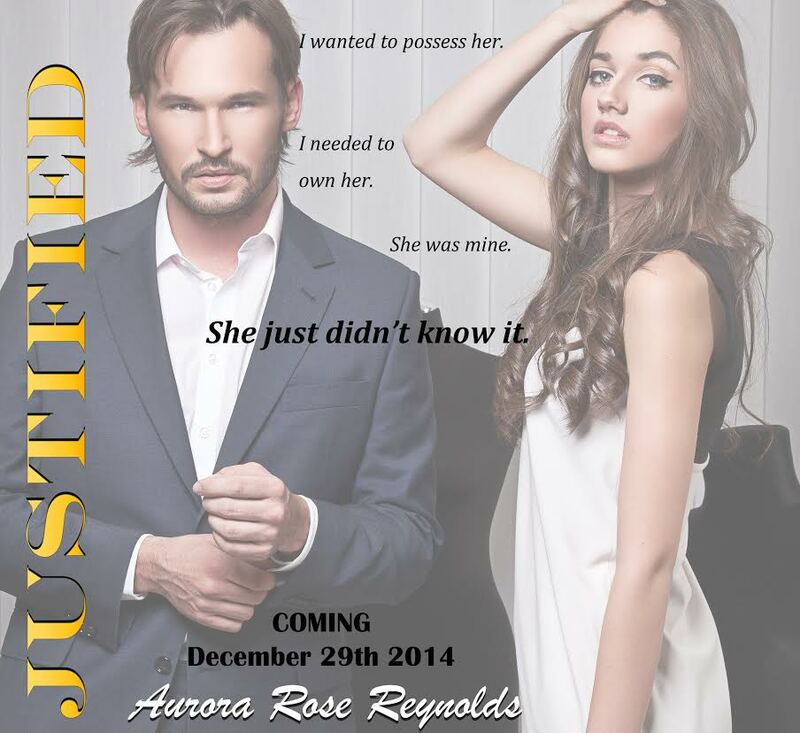 You feel it in your bones because of the outstanding way Aurora Rose Reynolds writes this book. You’re experiencing and feeling it all as you read this book. Those feelings just amplify everything from the page, and connect you more and more into what you’re reading. Twists and turns galore. One of my favorite aspects of this series is the nonstop action. I never know what or where the story will take the characters in, and what twists and turns are around the corner. I love the excitement that that brings, and how much that just engages me in the story. Aurora Rose Reynolds adds in just enough drama and excitement to keep you more than interested, but more importantly it all makes sense for the story and the characters. It flows extremely well, and all those twists and turns have you dying to know what will happen next. How it all unfolds. Myla and Kai have an unusual beginning to their story. It’s not typical, but that’s what makes the difference. Getting to know these characters and their story the way that it’s developed with all its intricate and detailed layers is fantastic. It all just works together so well, and slowly but surely you get more pieces to the puzzle that is Kai and Myla’s extraordinary story. And the more you see the more you love it, and the more you live it, the more you will be praying with all you’ve got that everything will work out for these two. Underground Kings all the way. This series has the title Underground Kings for a reason, and the way the author brings the theme of this series into the individual stories is exceptional. There is almost a tangible level of excitement and danger, but at its core it shows that these men and these characters are willing to give every ounce of their being to do what they know is right for the people they love and care for. Feeling and experiencing that kind of theme, that kind of devotion, that level of protectiveness, and just meeting characters that fully embody that sentiment is just effing spectacular. It also exemplifies the absolute best things from the characters and stories in this fantastic series. 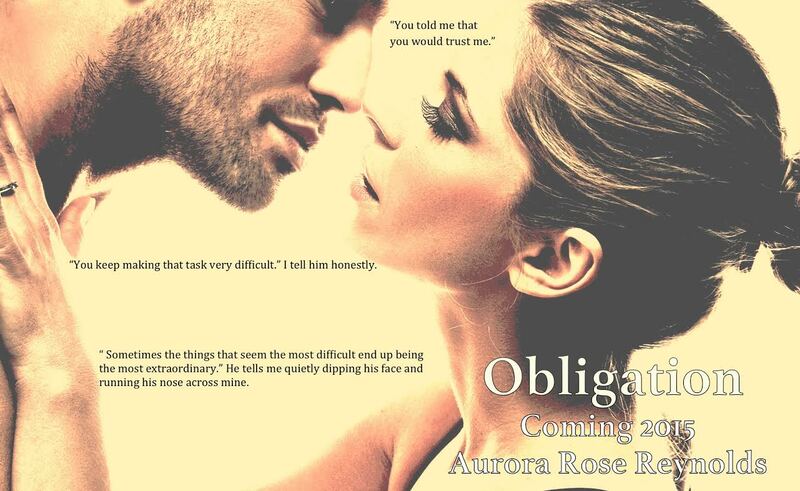 Obligation was another must read for me by Aurora Rose Reynolds. It had so many aspects to it that I just loved, and I simply couldn’t get enough of spending time with Kai and Myla’s phenomenal characters. They were just kind of the bees’ knees because of all they were and had to offer, and this author’s fantastic and well-crafted writing just brought them and their story to life. Myla and Kai and their fantastic story will have you feeling it all right along with them, and will have you fighting like crazy that these two fiercely passionate people can find a way to make it all work. Their story is going to take you on one helluva ride that is full of so much amazingness, and in the end you’ll be very sad to say goodbye, but at the same time you’ll just be ecstatic that you got to experience it all. Trust me. I have one heck of a book hangover because of that. Obligation is just another magnificent addition to Aurora Rose Reynolds’ Underground Kings series, and I for one cannot wait for more. Like I might be needing that tomorrow, because I am dying to jump back into the spectacular world this author created with this book and this series. Fingers crossed the next book is out very very soon!! 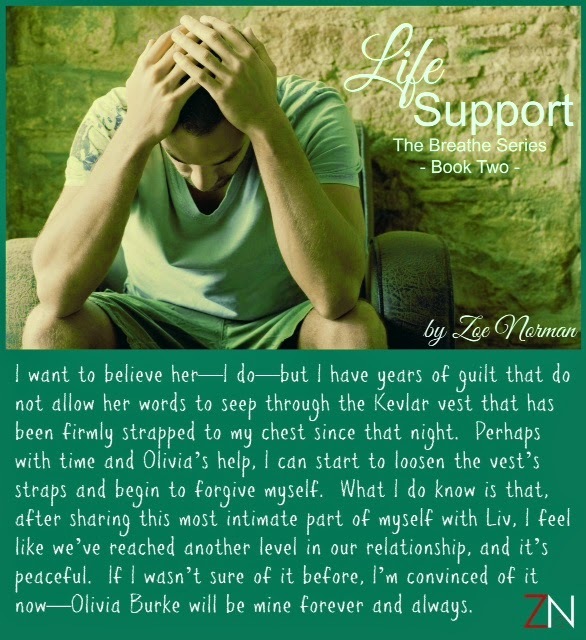 Life Support by Zoe Norman is an utterly fantastic conclusion to the story and characters they created in Rescue Breathing. This book picks right where the last book left off, and in about 2.5 seconds you will be fully engrossed again in Owen and Olivia’s story. This book will capture you in, and it won’t let you go until well after you’ve finished the last word. 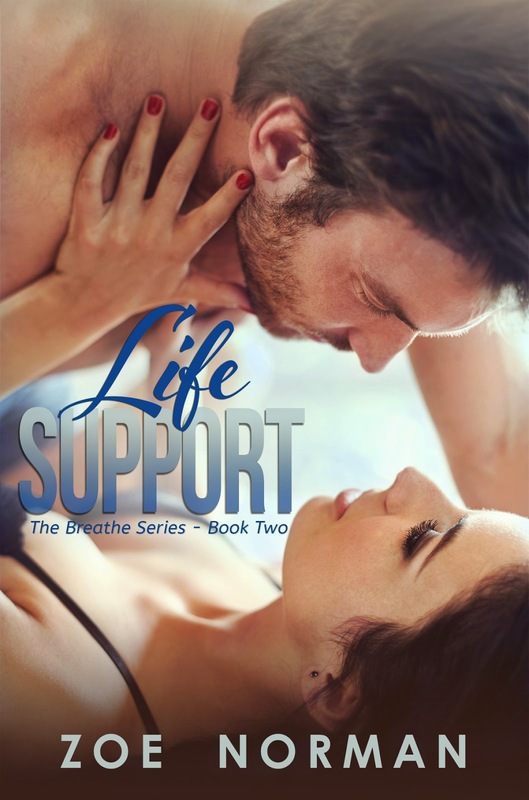 Life Support is a new chapter in Owen and Olivia’s relationship, and it follows the many ups and downs they face as they once again try to figure out all that is between them. I cannot rave enough about this book. It had so many outstanding aspects to it, and I couldn’t get enough of the characters, their story, and all the amazingness that was this book. Life Support had it all and more to make it a beyond outstanding reading experience. How hard and passionately Owen feels. Owen and his highly charming self just about melted my heart on every page. Literally. He feels with everything he’s got, and he owns every single thing he feels. I loved that about him. The fierceness and the level with which he feels towards Olivia is exceptional, and it just made me love him to death. These authors do an outstanding job of capturing those feelings and weaving them so thoughtfully throughout the entire book so that you can’t help but love this hot as all get out fireman who feels so deeply from the heart. The very real Olivia. I absolutely adored how real and authentic Olivia’s character was. I could imagine her so easily, and the thoughts, doubts, questions, and emotions she had surrounding her relationship with Owen felt so real that I felt like I was actually experiencing them. Feeling and experiencing those things through Olivia’s eyes made me love and care for her character so fiercely from the beginning. Olivia is a real female character with flaws and quirks and so many things that just make her fantastic. She just blew my mind with how fabulous her character was, and I enjoyed every single second I got to spend in her spunky and very memorable head. The level of emotion. The level of emotion and feeling in the book is outstanding. You get both characters perspectives, and you feel the huge level of ranging emotion they both have. It makes you feel every single little thing that happens so deeply. That level of emotion is well thought out, and extremely well developed and conveyed through this story. These writers did a magnificent job of making you feel it all, and you will love that. The fire between Olivia and Owen. The chemistry and connection between these two is off the charts. I certainly felt that when reading Rescue Breathing, but it’s amped up a notch in this book. 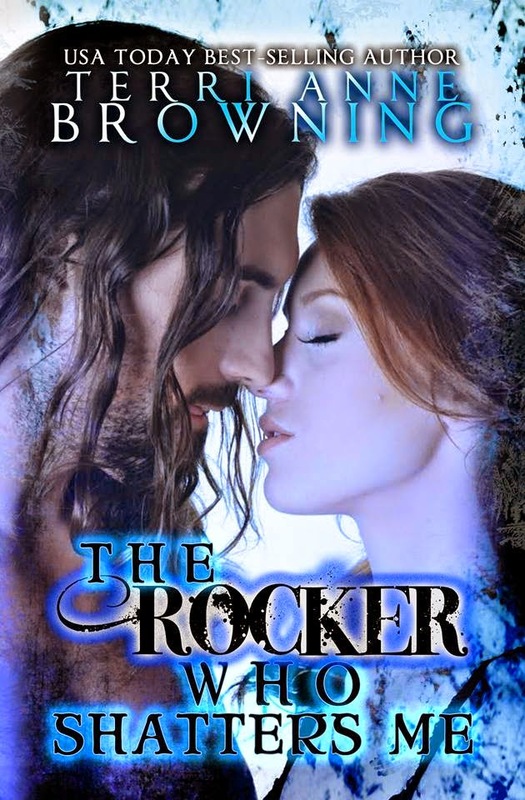 The heat, spark, and connection between Owen and Olivia fires off the page and you will feel that on every page. That makes it truly easy to get and love these two because you feel everything that’s going on between them. The charm. The charm that weaves its way through this book is fantastic. You feel it in the banter and connection between Owen and Olivia. You feel it with the supporting characters that make this book shine. You feel it with every fiber of your body while reading every page. This book is bursting with charm, and that will make you feel oh so happy with a genuine smirk on your face throughout your entire reading experience. The balance. There is a phenomenal balance between the many different kinds of moments in this book. The moments of pain, vulnerability and emotion will make your heart stop and have you instantly feeling and caring for the characters. The moments of heat and fire just exemplify what it is these two are fighting for. The moments of humor and fun just bring a real smile to your face, and the moments of love and happiness will fill you with so much bliss that you won’t know what to do with all the glow you’re feeling. These authors balanced all of that phenomenally, and that level of balance sets this book apart because it gives you everything you could want and need, from this one exceptional book. The ups and downs. I like that this book put Owen and Olivia and their relationship through some things. They have to work for that happy they both want together. It also puts them in some pretty interesting situations that are highly engaging to read. I loved and lived for those ups and downs because it made me want to fight like hell for these two, while they faced the understandable and highly believable ups and downs that came there way. The past. The past that these characters have individually rear their not so pretty heads in this book. The fears, doubts, and questions that come with those pasts are definitely something that is remarkable to read, but it explains so much about both Owen and Olivia. It was wonderful to read how that past incorporates into the present story, and reading how these characters face that past, made me love them even more. The underlying theme of second chances. This book isn’t a second chance romance, but let’s just say Olivia and Owen get some additional chances. They both have their flaws, their pasts, and they both make some not so fantastic choices, but what they do when given a new opportunity or chance took my breath away in the best possible way. Those chances exemplify what makes these characters so wonderful to read, and why this entire book was out of this world. Life Support has every single aspect that makes a book a 5 star read. The characters are so real you feel like you know them, and you will be fighting for them something fierce. The story will satisfy you in so many ways, and all of the intricate and well thought out pieces will come together in such an unforgettable way that will captivate you fully. I HIGHLY recommend this book and its predecessor Rescue Breathing, because Owen and Olivia’s story has cemented itself as one of my all-time favorites. These books just burst with their amazingness. These two will engage you with their fiery magic from the moment you meet them, and you will be very sad to let them go, but that in no way lessens the fact that they will blow you away with everything they’ve got. 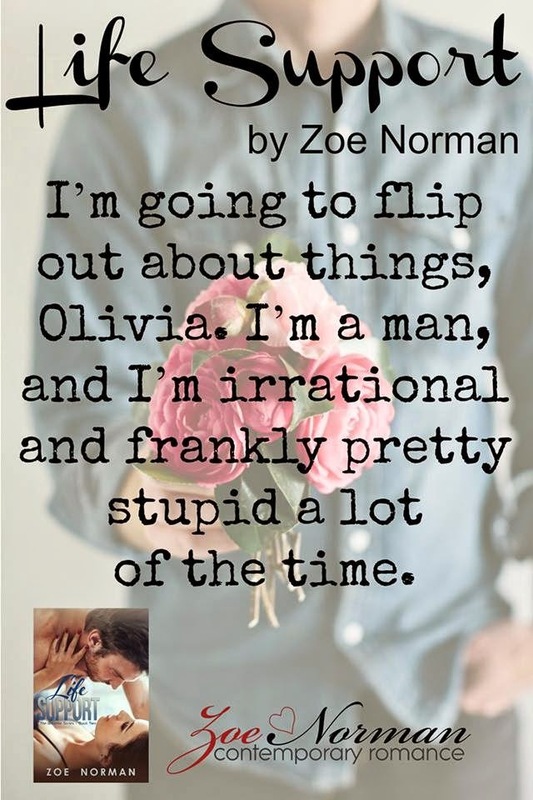 The story and characters that Zoe Norman so wonderfully crafted may come to an end, but something tells me the reading magic they created in these books will stay with me long after reading the end, and that is something I will always love and remember. Be sure to grab Rescue Breathing while it’s on sale for just 99 pennies! This is a must read! !